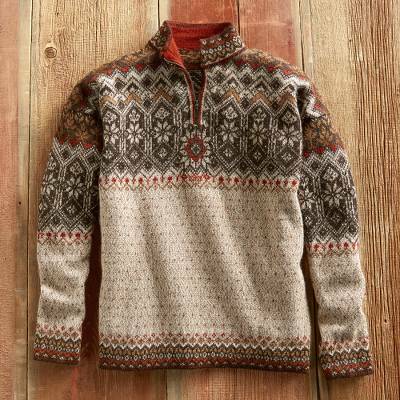 Men's Grecas Alpaca Sweater, "Grecas"
Indigenous Bolivian craftsman translate grecas--repeating geometric patterns--from the traditional garments of the Tarabuco region in this men's three-quarter-zip pullover sweater. The design is an interpretation of barroco mestizo style, in which indigenous and Spanish cultures have struck an aesthetic balance. This lightweight and cozy 100% alpaca sweater is hand knit by artisans in Bolivia. I love this sweater...it's so soft a warm. I've received many compliments about it. The work and skill that went into if are obvious. If you purchase one of these you will not be disappointed. A sweater like this is an investment that will last a lifetime. It's very hard to find a 100% alpaca from the region where they started, it's a Top Shelf product. As the prior review says, you will not be disappointed. The picture on the Web does not do it justice. Much better colors , you will see.. Buy it while it last. This is a beautiful well made sweater! Very happy!! Excellent quality and fit. This Superb Sweater. I love this sweater! It is very warm but not bulky or heavy. I highly recommend it! "The Love of this sweater"
I bought this sweater in 2012 for my son in college as a Christmas gift. It was his absolute favorite sweater! Five years later in 2018, the sweater accidentally got in his laundry. My son phoned and was absolutely broken hearted about his sweater. So I bought a replacement. He was so happy to have his favorite sweater back. Truly an heirloom! Very nice colors and design. Very soft material. The best sweater I have ever had. I am glad I purchased one. I highly recommend this sweater. This is gorgeous, very soft. I bought an XL which is more like a 2XL. This sweater is comparable to Dale of Norway sweaters. Very high quality.